Now that GNOME 2.30 stable is out, we can all look forward to GNOME 3. I’m extremely hopeful that the GNOME applications will see some much needed updates and additions of missing features. One feature that I really miss from Digsby and Trillian in Windows is the ability to quickly respond to a message via the notification bubble. Sometimes you just want to send a quick and short response. Thats why I’d like to see this feature added to Empathy for the release of GNOME 3. Mockup of how this would look. 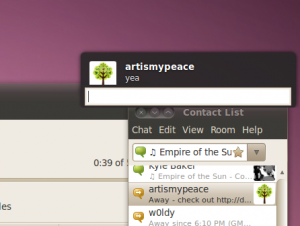 In Ubuntu, the notifications appear in the upper right corner of the screen and (as far as I’ve seen) contain no buttons or other actions. Clicking them isn’t even possible as the click carries through to whatever rests below it. If I’m not mistaken there will be notifications with buttons for interaction, but if I understand it correctly then the “Fallback alert boxes” will offer this option. If this is true then my mockup could easily be put to work!